Thread a needle with the thread you wish to use, enter it away from where you want the loop to be anchored and bring the needle up at the spot you want the loop. Tie a knot in the end. 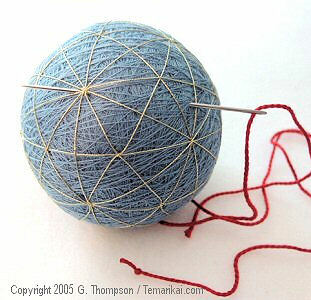 Pull the thread through, snug the knot up to the surface of the temari, and pull ("pop") the knot into the mari surface to hide it. If needed, try using the eye end of the needle to push the knot under the mari wrap. It needs to be fully hidden. Re-enter the needle back into the exact same spot the thread exited from, bring the needle out away from that point. Pull the thread through and snug it down the to size loop you want. 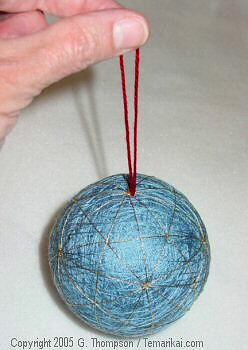 Pull the opposite end of the thread, coming out of the temari to extend it a small distance. You can place a pencil or something in the loop if you want to safeguard it from pulling through. Tie a knot and clip the thread. Pull the loop back out, snugging the tail and knot up against the surface of the temari. Pull on the loop thread snugly enough to "pop" the knot under the mari wrap to hide it. This also anchors the loop.